The Lower Monumental Dam on the Snake River, near Kahlotus, Washington. 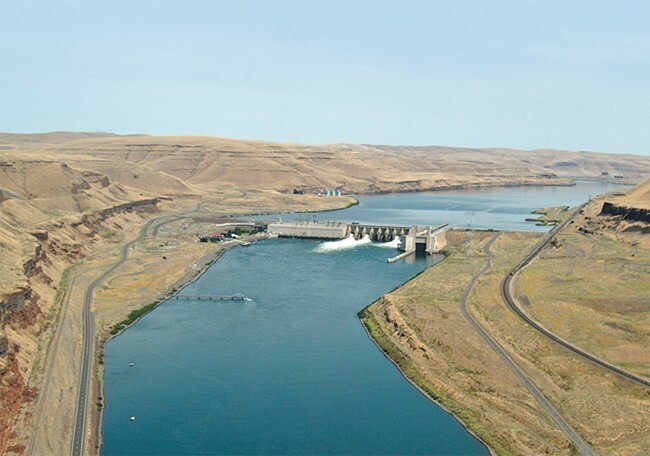 Building on last year's event, hundreds of people from tribes and environmental groups throughout Idaho and Washington are expected to create a massive flotilla on the Snake River near Clarkston as part of an event calling to remove four lower Snake River dams. The Free the Snake Flotilla and River Recreation Day is supported not only by conservation groups and environmental advocates focused on restoring fish runs, but also by recreational rafting and fishing businesses. On Sept. 7 and 8, the group plans to camp at Chief Timothy Park outside of Clarkston, where participants can take part in outdoor activities and learn about efforts to restore and protect the river. "This year, in recognition of the first Nimiipuu Tribal canoe in nearly a century, the flotilla will focus on tribal land and tradition," Free the Snake organizers write at freethesnake.com. "Canoe families from sovereign tribes across the Northwest will gather on the Clearwater River, and paddle downstream through the heart of Lewiston and Clarkston toward Chief Timothy Park on the Snake River. There, hundreds of nontribal salmon advocates will join them on the water for a display of solidarity and a resounding call to FREE THE SNAKE!" After the paddle on Saturday, environmental activist Winona LaDuke, who is known for her work on tribal issues, is expected to speak. Find more information at freethesnake.com. Thu., April 25, 3:30-4:30 p.m.